This pair will set you back a pretty penny. 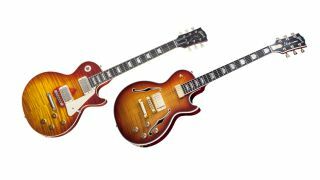 Gibson has announced two new Les Paul models, the Les Paul Supreme and the Southern Rock Tribute 1959 Les Paul. The Supreme is about as ostentatious a Les Paul as we've ever seen, boasting a AAAA grade maple top with custom binding and f-holes, a floating humbucker at the neck and 492T at the bridge, mother of pearl inlays and a general air of superiority. Which is well deserved, with an SRP of $5339. The Southern Rock Tribute 1959 Les Paul meanwhile pays tribute to a genre with a unique 'reverseburst' finish that leaves a heart shape around the bridge, a custom Southern Rock medallion on the reverse of the body, '59 style neck profile and a pair of custom humbuckers. This little Southern Rocker will set you back $6853. For more information visit the official Gibson site.